The second-most congested city in the nation is considering a plan to charge motorists to drive on local roads in an effort to relieve traffic woes. A top transportation official in San Francisco recently said that charging motorists to reduce congestion is “totally doable,” but the city has yet to gain public and political support for the plan, according to the San Francisco Chronicle. If a formal program is adopted, this would put San Francisco in the same realm as other major cities, including Stockholm, Singapore and London, that have already implemented similar congestion pricing plans. The goal of congestion charging is to reduce travel delays and greenhouse gas emissions, while at the same time improving public transit systems and driver experiences. San Francisco’s Mobility, Access and Pricing Study (MAPS), funded by the Federal Highway Administration, analyzed different congestion charging scenarios and so far concluded that the most effective fee policy would be $3 per trip for motorists during weekday peak periods (e.g., 6:00 – 9:00 a.m. and 3:00 – 7:00 p.m.) Taxis would be exempt from the fee, and other groups, including low income travelers, commercial transportation fleets and disabled motorists, would be offered discounts ranging from 33 to 50 percent.The city estimates that the fees would total $35 million to $65 million in annual net revenues, which would be reinvested to improve San Francisco’s transportation systems. “The problem with congestion pricing is that it is regressive, affecting people who have lower incomes far more than people who make the big bucks,” writes melmelish. “This idea will KILL business in SAN FRANCISCO,” says spysea. “This is a far too typically SF-style “solution” to a complex problem: make it more difficult to drive, but offer no alternatives, i.e. improved bus/rail service, flexible work schedules, increased park/ride options,” says SFX. “I still don’t understand why they don’t just implement a huge downtown parking tax for all meters and garages…This would have the same end effect of reducing car trips into downtown, no? That said, there needs to be more carrot and less stick in this plan,” says Karst. “This seems like a typical City anti-car measure that punishes drivers without providing an alternative. There are obviously a few car-hating posters on this board, but they do not reflect the feelings of the majority of people who live and work in the City who find using a car to be their most desirable alternative,” says SFBurke. While some people said congestion pricing was a good idea, the overwhelming response indicated anxiety and frustration over the city’s current transportation scheme, which is considered largely inadequate to accommodate rush-hour commuters. Monday, December 8, 5:30 – 7:00 pm, San Francisco Ferry Building, Port Commission Hearing Room, 2nd Floor. For more info, click here. How did this San Fran study come about? 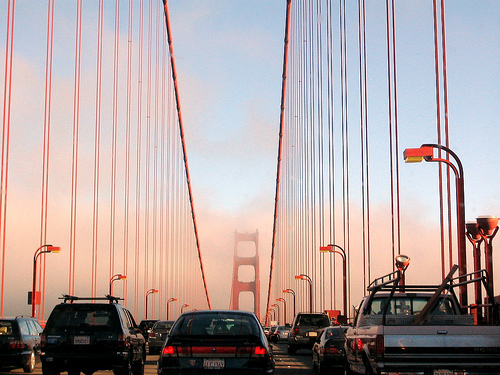 In January 2006, the Federal Highway Administration awarded a $1.04 million grant to the San Francisco County Transportation Authority to study congestion pricing and mobility. In March 2007, the Authority initiated the Mobility, Access and Pricing Study (MAPS), making San Francisco the first city to study congestion pricing and mobility in a U.S. metropolitan area. A Congestion Charge for Mumbai?